When I saw the package with the "Dr. Seuss’ The Grinch" Blu-ray/ DVD, I was so excited. We really enjoyed seeing the film in theaters and looked forward to seeing it home now with all the behind the scenes bonus features. Note: I received bluray/dvd for review purpose. Any personal views expressed are always 100% my own. 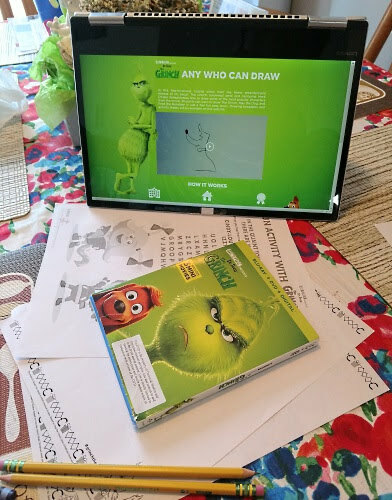 But since we had a few hours before family movie night, I thought the kids would enjoy a few "Grinchy" activities including learning how to draw a Grinch (and other characters), word puzzles and coloring sheet. Now originally, I only planned for 3 kids but my (3rd) nephew insisted on joining in. So I handed him a coloring sheet, crayons and let him have fun. I wasn't sure how easy the kids would be able to follow but they did well. The kids liked the side by side comparisons since it helped them with drawing their own Grinch. Soon my son and niece had both drawn their own Grinch. My (1st) nephew had a little hard time drawing, but I suspect that because he was trying to hard to be perfect. I explained to him he could draw whatever he wanted. But because his drawing didn't look at the other kids, he wasn't happy. So we decided to switch over to the coloring sheet and he was much happier. Go figure with kids! The kids took turns drawing, doing the puzzles and coloring. At the end each discovered what they liked best and was proud to show it off. By then, it was time for family movie night. So we all gathered around and watched The Grinch on Blu-ray/DVD. The kids enjoyed watching The Grinch try to take over the holidays and enjoyed the movies message of friendship and being kind. "Dr. Seuss’ The Grinch" movie releases on 4K Ultra HD, 3D Blu-ray, Blu-ray, DVD and On Demand on February 5, 2019. From Illumination and Universal Pictures Home Entertainment, the film is based on Dr. Seuss’ beloved tale about a cynical grouch who goes on a mission to steal Christmas from others, only to feel his own heart grow three sizes larger through unexpected friendships. The new home entertainment edition contains more than 60 minutes of bonus content, including three mini-movies. It also includes stunning featurettes, a how-to-draw tutorial and much more. Narrated by Grammy Award ® winner and Oscar ® nominee Pharrell Williams, Dr. Seuss’ The Grinch stars Academy Award ® nominee Benedict Cumberbatch (Dr. Strange, “Sherlock”) as the infamous Grinch, who lives a solitary life inside a cave on Mt. Crumpit with only his loyal dog, Max, for company. Entries must be made on or before 11:59 p.m. February 8, 2019. We'd enjoy the coloring pages. I think we would enjoy the coloring the best. "Leave a comment telling me, which 'Grinch' activity will your family enjoy?" Drawing could be really creative and fun! Our family would enjoy the coloring sheet! Looks like a lot of fun! I think just watching the movie together is good enough. My older kids would love to learn how to draw the Grinch. My granddaughters would like to learn how to draw the Grinch. I think they would enjoy the coloring sheets the most, even though the word search looks fun to me. Learning how to draw the Grinch looks like fun! My family would like the word search puzzles. I think we would like the coloring sheet. The coloring sheet & word puzzle. My son would love the learn how to draw the Grinch and I would enjoy the word search! Learning how to draw the grinch would be fun. I think my family would enjoy both the word puzzle and coloring. My family would most enjoy the word search! My daughter would enjoy the word puzzle. we love to color so the coloring pages would be our first activity. We'd love the coloring pages! We'd enjoy the coloring pages! The coloring pages would be fun for our family to use. My son likes to draw so he would enjoy learning how to draw the Grinch. My kids would love the coloring! My kids would love the coloring and word find pages. The learning to draw a grinch looks fun too! My kids would love all of the activities but the word search would be their favorite. My son and I would enjoy the coloring! The word searches. My boys love them. My family would enjoy the Any Who Can Draw - Hosted by an Illumination artist and head of story Mark O'Hare, you’ll see step-by-step how to draw some of your favorite characters from this beloved holiday classic; Grinch, Max and Fred! I think my kids would enjoy the coloring the most. We will like arching the part about bad winter weather. Id love the coloring pages! My son is going to love the word search. I have passed down my love of crosswords and word searches to my little guy. They would definitely enjoy drawing the Grinch and the coloring pages as well. We would enjoy doing the puzzles. time to learn how to draw a Grinch. My niece would love the coloring pages! We would most love coloring! We all love art here.